The bus caught fire in the middle of a busy street in China. 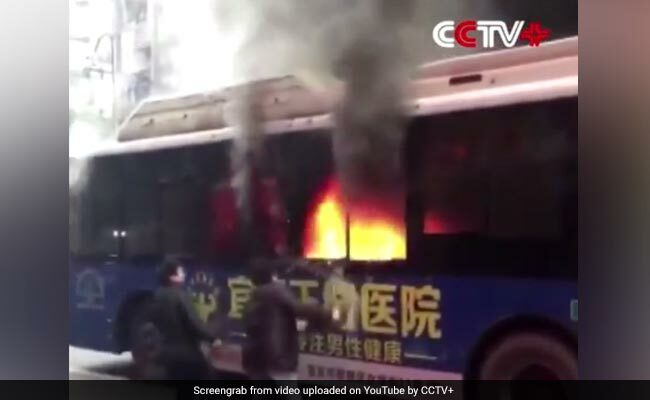 In a heroic display of quick-thinking courage, residents of Yibing City of southwest China's Sichuan Province on Wednesday helped save elderly passengers trapped in a burning bus. In a shocking incident on January 3, a bus caught fire in the middle of a busy street. Fortunately, bystanders helped save the trapped passengers inside the bus by breaking the windows and going inside to help with evacuation. Footage from security cameras on roadside shops shows a shopkeeper stepping into the flames to pull out elderly passengers inside the bus. The people also helped put the fire out after evacuating everyone. The accident caused no deaths but left the driver injured, according to police. "Everyone would do the same as what I did under such circumstances. If I were trapped on the bus, other people will do the same thing to save me. It's normal," said Pan Haifeng, one of the shop owners joining the rescue, according to CCTV Plus.